of the dogs. A new wilderness adventure has started! A trip for approximately 3-4 hours. We use a large sled with a big team of dogs (approx. 12 dogs) and if you like, you get the opportunity to drive the team for a while. We take a break at a Lavvu (Lappish tee pee), and by the light of an open fire and along friends we will have a cup of coffee or tea with some home made bread and local specialities. Available november - april. During our longer tours you will drive and take care of "your own team" help out with food preparation, wood chopping, building a fire and fetching water. All tours starts with a brief course in dog driving, techniques and safety. The tour will be enriched by having a highly knowledgeable and professional guide on hand throughout the trip. 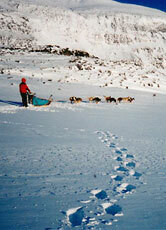 You may choose to travel on the guides sled or take charge of your own sled drawn by 3-5 dogs. It will be one overnight stop in our comfortable wilderness camp (no electricity) there you will have access to an (wood heated) evening sauna. The guide will also prepare delicious local specialities to give you an authentic taste of the local cuisine. Winter clothes and full board is included. A minimum of two bookings, maximum six persons. Available: 11 January- end of April. Price: 2400 SEK/ pers. You may choose to travel on the guides sled or take charge of your own sled drawn by 3-5 dogs. Two overnight stops in comfortable cabins. We are going to travel 30-40 kilometres a day. Day 1 and 3 in the beauty wilderness surrounding Kiruna. Day 2 up in the amazing high mountains. We end day 1 with a northern light evening in a Lavvu (Lappish tee pee) by the open fire and among friends we enjoy the authentic taste of the local cuisine. Day 2 we end with a sauna (wood heated). Winter clothes and full board is included. A minimum of two bookings, maximum six persons. Available 11 January- end of April. Price: 4500 SEK/ pers. 2-7 days You take charge of your own sled drawn by 3-5 dogs. Driving together with a mountain guide up in the high alpine area where the view of the mountains is fantastic, you are on the Royal trail. We overnight in mountain cabins, often without electricity and running water. We are going to travel 15-60 kilometres a day depending on snow conditions and the weather. We are going to have the highest mountain in Sweden, Kebnekaise on our side, 2104 metres high. Winter clothes, sauna facilities and full board is included. A minimum of two bookings, maximum four persons. Available 15 March - middle of May.